So you’ve finally made up your mind and are now serious about getting in shape, and that’s good. Before tackling any heavy exercises however, it is best to start off with a beginner workout. While your excitement at the thought of doing heavy duty workouts is understandable, you need to start out slowly. Workout routines for beginners are necessary if you want to do advanced workouts. It is no different from riding a bicycle or playing the guitar: unless you know the basics you won’t be able to make any progress. Forcing yourself to lift heavy weights immediately or performing complex stretches could lead to injury and hinder your progress even more. If you have never worked out before, you need to keep several things in mind. First, you have to give yourself time to get used to it. You cannot force yourself to do hour long workouts every day as it could lead to injury. – You don’t need to go to the gym if you’re just a beginner. All you really need are a pair of dumbbells. If you can get an exercise mat that’s even better because it allows you to work out in comfort. However it’s not really necessary and more like an option. – As a beginner, you don’t need to buy expensive home workout equipment. As we will show here, a lot of the workouts don’t even need equipment. – Make sure there is adequate ventilation in the area where you will work out. You need to work up a sweat, yes, but you must have room to breathe. – At first, focus on getting the movements right. There is no point increasing the number of reps and sets unless you are doing it correctly. Once you have gotten the movements properly you can start increasing the reps and sets. – The duration of each workout depends on your strength, conditioning and goals. For beginners it’s best to start with 15 to 20 minutes during your first week. Just choose from any of the workouts below and include them your regimen. As a beginner you should strive to exercise 4 to 5 times a week. You can also work out 6 times a week but make sure you give yourself at least a day off. This will be necessary so your body can recuperate and work out again. There are many types of workouts, but they can be divided into two types, cardio, where you work to lose pounds and be more flexible, and weight / strength training. As a beginner you don’t have to worry about this as you should just focus on learning how to work out. But if you decide to go try strength training, you have to do it every other day. Do not lift weights every day because your body needs the rest day to build up those muscles. But as we have mentioned your priority right now is to get your body acclimatized to exercise. Whether you’re a beginner or an advanced gym rat, you must always do a 5 to 10 minute warm up. If you study how to do a beginner workout routine you’re going to find that warm ups are almost always mentioned. The reason is simple: your muscles need to loosen up before you perform any strenuous activity. By doing warm ups, your muscles will relax and make it easier to do different types of workouts without straining or causing injury. Once you’ve loosened and worked up a bit of sweat, you can begin exercising in earnest. Warming up raises your body temperature by 1.5 to 2.8 F, and that is sufficient to cause your body to sweat. As your body warms up, blood starts to flow in your muscles and makes sit more flexible. There are many different ways to warm up. It can be as simple as jogging around for 5 to 10 minutes. Or you can limber up and stretch your arms, legs and the rest of your body. Just make it a part of your regular routine and you won’t feel stiff when you work out or sore after the workout. To include this in your beginner workout plan, lie face down on a mat or the floor. Position your arms so they are shoulder width apart. Slowly raise your body and make sure your back is straight. Slowly lower your body until your chest is an inch off the mat. Raise up quickly until your arms are straight. Repeat. Push ups work out several muscle groups, increasing muscle strength and allowing for maximum growth. Push ups are also perfect for working out at home and you don’t need any equipment either. To perform this beginner workout, hold a dumbbell in each hand, with an overhand grip at shoulder height. Palms faced forward, press the dumbbells over your head until your arms are extended. Make sure your elbows are at your sides and they are not flaring out. This workout is ideal for beginners because it is safer than lifting at the back of your neck. This workout also reduces the possibility of shoulder and neck injuries while keeping the pressure off your joints. So while you’re working out and gaining strength, the routine does not compromise your health. Stand up and hold a dumbbell in each hand. Your heels should touch the floor and the balls of your feet set on steps. Lift your heels and pause at the top, contracting. Lower yourself and go back to the starting position and do it again. The dumbbell calf raise is important because it works out a lot of your leg muscles. It would be a mistake to ignore your calves as getting them in shape is necessary if you want to maximize your strength and endurance potential. 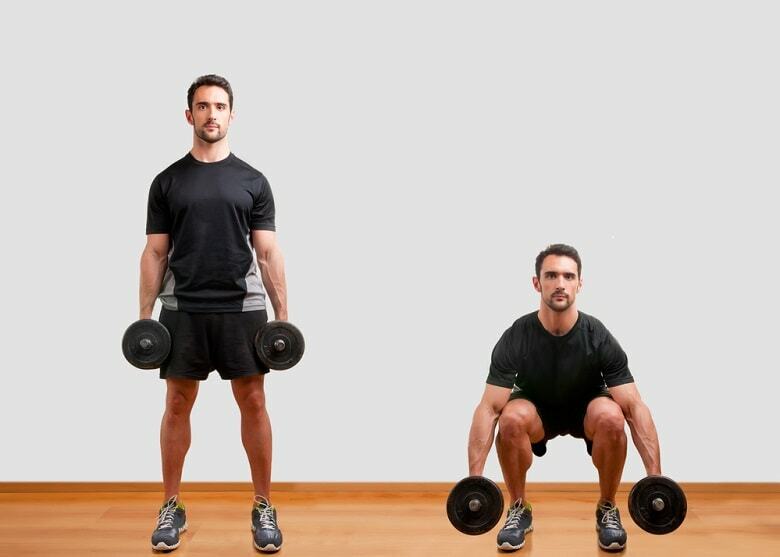 Hold a dumbbell in each hand and stand in front of a bench. Put your right foot on the bench and lift your body by pushing your heel. Take your right foot off the bench and repeat with your left foot. This looks like a simple workout, but it is very effective in working out every muscle in your upper leg. Your hamstrings, quads and glutes are all going to get a good workout. This workout is also low impact and won’t expose you to knee injuries. This is a beginner workout routine for men and women that can be easily learned. Grab a dumbbell in each hand and set your legs apart by shoulder width. Assume a squatting position until the weights are just an inch off the ground. Ensure your chest is out and your knees are over your toes. Do not lean forward and don’t arch your back as you squat. Exhale, get up slowly and go back to your original position. Repeat. Free weight or dumbbell squats are ideal for working out different parts of your body without causing undue stress. This method is also effective for concentration development and improving your movement range. It takes some time to master but it’s worth it. Hold one dumbbell in each hand and curl them until they reach shoulder level. Your upper arms need to be stationary when you make the curl. Concentrate on keeping your elbows from moving. You can move your lower arm only. When you reach the top, contract and squeeze your biceps. Repeat. 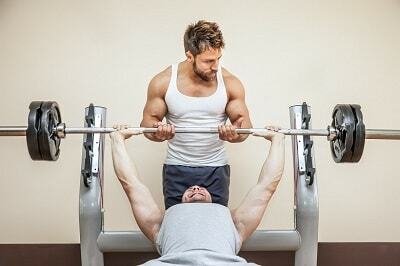 Bicep curls are very common and one of the most effective in promoting muscle growth. It is really important in this workout to keep straight upper arms so you achieve optimum results. Place your left hand and knee on a bench. Keep leaning forward until the floor and your chest are almost parallel. Grab the dumbbell with your right hand. Tuck your elbow in and set your bicep along your torso. Set your elbow at 90 degrees so the dumbbell is below you. Swing the dumbbell until you have straightened your arms behind you. Lower your arm and go back to your starting position. These workouts are great for isolating your triceps. It is also safer than dips on your couch as as it does not put too much strain on your shoulders. Triceps kickback also reduces joint pressure while giving your muscles a good workout. Dumbbell walk is also known as the farmer’s walk. You just need to grab a dumbbell in each hand, hold them by your sides and start walking. Walk with your shoulders straight. Walk as quickly as you can but without changing your posture. If the farmer’s walk is too easy, you can toughen up your workout plan for beginners by increasing the dumbbell’s weight. The best thing about the farmer’s walk is its simplicity. You just need to walk and your muscles will do the rest. Your movements will target your front deltoids, upper traps and shoulders. This workout also improves your grip and promotes endurance. This beginner bodyweight workout requires you to hold a light dumbbell in both hands. 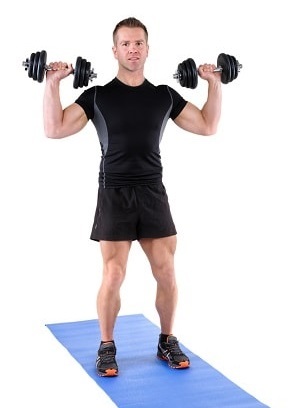 Raise the dumbbells on your side slowly until the dumbbells are shoulder height. Do not raise them any higher. Do not swing the dumbbells and just try to lift them. Once the dumbbells are shoulder height, pause there for a second or two. Lower your arms slowly until you’re back in your original starting position. If you’re into home workouts, this is the one to try as it goes far in terms of boosting shoulder strength. By practicing this on a regular basis you’ll develop stronger shoulder muscles, giving you that V-shape that you’ve always wanted. Position your body like you’re gong to do the push ups. Rather than your hands however, rest your forearms on the exercise mat. Tense your glutes and abs and keep your back straight. Maintain this position and don’t let your hips or back sag. Planking is a very effective workout because it works your core properly without risking injury. It is also the first step to getting that six pack you’ve always wanted. Planks are also more effective than crunches because crunches can lead to spine injuries if not done correctly. Lie down and set your arms by your sides. Your legs need to be flat. Raise your legs and make sure to engage your abs as you raise your legs. Maintain your legs’ position for a moment and set your core. Lower both legs at the same time. The leg drop is one of the most popular types of workouts at home and the gym for its ability to push you to the limit. Just as important, it sets your core and keeps your pelvis from going into motion. Why is that important? Because once your pelvis is unable to move, your body is forced to use your rectus abdominous muscles, AKA that six pack inside you. The more you use these muscles, the more defined they will be. Lie down on a mat with your hands raised up. Your feet should be raised up and positioned so your knees are at a 90 degree angle. Straighten your leg until each heel is just a couple of inches off the mat. Go back to your starting position slowly. Do this with your other leg. When you perform the deadbug, it forces your heels to hover and your legs to extend. This forces you to work your core stabilizers and not just limit the activity to your abs. If you keep this up, you’re going to build a lot of muscles and gain physical strength. Hold a dumbbell in each hand and lie down on the mat. Bend along your elbows and position the dumbbells over you. Straighten your arms and press up. Pause when you reach the top and slowly go back to your starting position. This is a variation of the regular plank where you lie on your right or left side. You set your legs straight and use your elbow to prop your body. Work your core and lift your hips until your body is straight. Maintain this position for a few seconds and take deep breaths. Repeat this on the other side of your body. The side plank is a nice exercise for working out your lower back’s small muscles. Doing the side planks on a regular basis also improves your spinal health. Just as important is it prevents back pain that is so common among beginners. Do not force yourself: allow your body to get used to this and increase range and speed slowly. If you’re not sure which workouts to try, planking, squats and any of the dumbbell workouts above will do. If you’re doing high intensity workouts, stretching is necessary. If you’re going for strength training, stretching is not mandatory though warm ups are. This has been said before but it bears repeating: it is not enough to just work out as you have to complement your exercise. Dieting is necessary if you want to build muscles. The exercise only approach isn’t going to work because you’ll just lose fat. If you want to build muscles while losing fat, eat healthy foods. Another common mistake novices make is focusing on just one area. Many who want to lose belly fat just do sit ups and crunches and ignore their arms, legs and other body parts. This is a mistake because it will lead to imbalance. Even if you want to focus on a specific body part, it’s still ideal if you develop different parts of your body. By working on all areas, you will be healthier and stronger. You should also use your full range of motion during workouts. Exert some effort and be willing to push yourself to the limit. Lastly, do not overdo it. Working out for too long too often is not going to speed up results, and could set you back. One of the problems newcomers face when working out is staying committed. There’s excitement during the first few days, and then boredom sets in. But as we have shown here there are a lot of workouts you can do. The bottom line is you must take your time so your body get used to the activity. 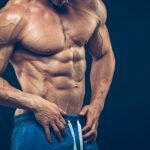 By performing the beginner workout techniques presented here, you’ll be on your way to getting in shape and doing more advanced exercises soon.